I’m looking outside my window at the dense fog and winter chill clinging to bony tree branches and wishing I could see sunshine and palm trees instead. I’m sitting here surrounded by a pile of crumpled Kleenexes with raging sinus pressure and wishing that I could snap my fingers and this horrible cold would just disappear. I’m thinking about how I want so much to change in the next few months and wishing that none of it would change at all at the same time. I’m realizing that as much as I look outside, inside or to the future and wish for so many things to be different or the same, in every case, I’d rather just be here, with you, dear reader. And a warm, buttered slice of this ricotta-olive oil herb bread. Life is just much simpler that way. I’d been longing to make another sandwich loaf for a while: One that’s dense yet soft, flavorful yet mild, healthy yet delicious. So when I happened upon this recipe, I knew it was the perfect fit for me and my Saturday afternoon. The creamy ricotta cheese, though invisible to the taste buds, renders this loaf soft and chewy. The olive oil gives it mild flavor support but major moisture. And the herbs, though faintly present, provide a robust and refreshing aftertaste to every slice, one made even better with a dip in the toaster and a spackling of butter or cream cheese. It’s the best thing to make when nothing else is going the way you want it to go (or, exactly the way you want it to go?) — when nothing is certain. This bread is loyal and steadfast to a fault: Hard to mess up and hard to resist when it’s beaming up at you straight out of the oven. It’s just the antidote for a wishful day. In a large bowl or bowl of a stand mixer, whisk together 1/4 cup lukewarm water, yeast and 2 tablespoons flour. Let stand 5 minutes until foamy. To the proofed yeast mixture, add olive oil, ricotta cheese, salt, herbs and flours and stir to combine. Attach dough hook and slowly mix in enough of the lukewarm water so that dough comes together and pulls away from sides of the bowl. Increase speed to medium and knead 3-5 minutes or until dough is smooth and elastic (or, stir water into dough with a wooden spoon until you’ve got a cohesive dough, then remove from bowl and knead on a lightly floured counter top 10-15 minutes until smooth and elastic). Shape dough into a ball and place in a lightly oiled bowl. Cover with lightly oiled plastic wrap or a tea towel and let rise in a warm place until doubled, about 1 hour. Remove risen dough from bowl and press dough into a 9-by-9-inch square. Roll up dough from one side into a log and tuck swirled edges under (so the top of the dough is taut). Place log in a lightly oiled loaf pan, cover with lightly oiled plastic wrap or a tea towel and let rise in a warm place until doubled, about 1 hour. Preheat oven to 375 degrees F. Remove plastic wrap or tea towel and bake for 30-40 minutes, or until a thermometer inserted in the dough reads about 200 degrees F. Remove from oven and let cool in pan for 10 minutes; remove from pan and let cool completely on a cooling rack before slicing. 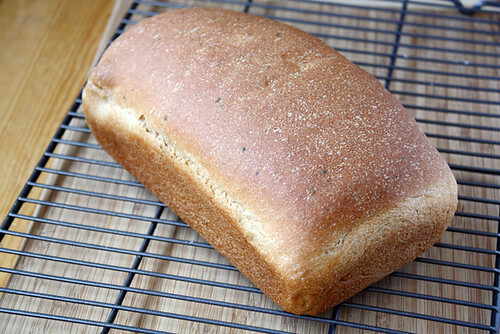 Your bread turned out so beautiful! Love the addition of herbs. Makes it much better! Thanks for trusting my recipe! Roxana — Thanks! And thank YOU for the inspiration! It’s a wonderful recipe. 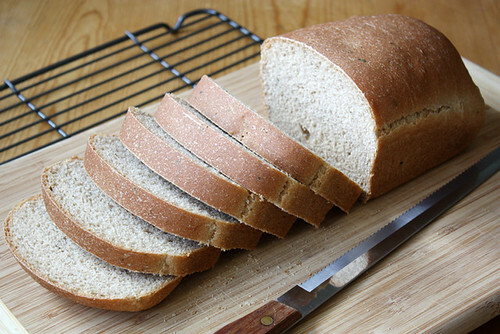 I need to make sandwich bread again. This sounds delicious, I just need to shake my bad luck with yeast! Flat sandwich bread would be gross! Yum!! I wonder if this would benefit from fresh home made ricotta? My mother has been making it for years. Fresh ricotta is light years better than supermarket stuff in uncooked recipes but I have yet to cook with it. I think it’s about time!! This looks so tasty–and your slices are so uniform! Here’s hoping that the winter blues subside soon. February is always the hardest month, I think. I am currently baking this bread in the oven, but even before I taste it, I am amazed!! Unfortunately, I don’t have a lot of “modern conveniences” in my teeny-tiny kitchen (like food processor, stand mixer…), so I did everything by hand – the REAL old-fashioned way! It was easy to hand-mix, knead, and of course rise. This is the first bread I am making in a loaf pan. I typically “free form” my breads. I am so excited, can’t wait to try it!! This is my first time commenting but I just had to share how much I love this recipe. I have made this bread several times and I am so impressed with how consistent and well-behaved it is! I like how you phrase it, “loyal and steadfast to a fault,” because it is really true. I’ve changed up the herbs a few times to suit a particular whim but otherwise I follow the recipe and this loaf always turns out just as expected. This is such a relief because I am definitely a novice baker– I don’t have a stand-mixer so it really helps that this can be done by hand with relative ease! Smells heavenly while baking, just the perfect thing for the days when you need a culinary comfort boost. 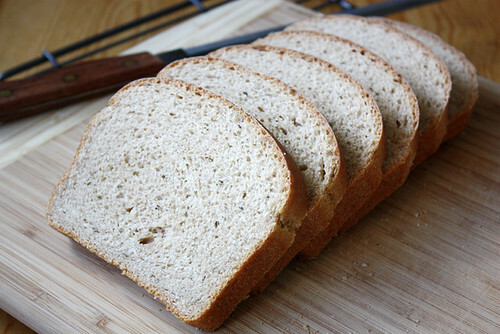 The flavor is so delicious and it makes excellent toast, my family gets a kick out of it too. Thank you for posting it!